Embrace the Mana of the Islands of Tahiti with these special vacation experiences. Only 8 hours from Los Angeles! You may come to the islands of Tahiti to seek paradise but as soon as you set foot on its shores, you’ll find a whole lot more…. you’ll discover experiences of a lifetime. Visitors to Tahiti are quick to notice a change in themselves. Years fall off their face and their bodies are suddenly infused with youthful energy. Tahiti’s deepest secret lies in its magic to rejuvenate both body and soul. The beauty of the Polynesian people is famous worldwide. But only those who visit the islands of Tahiti know that it is contagious. There is something in the air, the food and the local concoctions that will give those who touchdown a gorgeous glow. Maybe it’s the secret formula of the local “Monoi” which has been used since ancient times to beautify the skin and hair. Perhaps it is walking on a deserted beach with your loved one or maybe that adrenalin rush of snorkeling with rays and sharks. Or perhaps the locally prepared meal with infusions of Tahitian vanilla, as well as mangoes, coconut and papaya with local baguettes that rivals any in Paris. Only in Tahiti can you experience these things while at the same time being on one of the most beautiful and exotic islands on earth. And remember the secret language of the Tiare flower. Place the Tiare behind your left ear, the side of the heart, to signal your love has been won. Put it behind the right ear to indicate that you are open to proposals. We are proud with our partners to offer this selection of exceptionally-valued vacation experiences for a limited time offer, valid for sale through March. 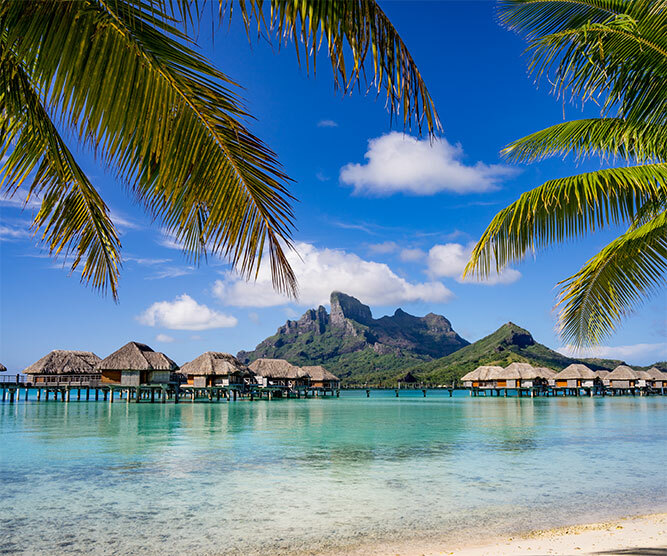 Enjoy the luxury of Bora Bora, see Tahiti and Moorea with their majestic peaks. Explore one of our islands of Discovery, the more rustic and less visited Huahine or Tikehau. Or do something totally different and take a yachting experience around our islands. It’s all here for you. Please enjoy! If you can't find exactly what you're looking for, just ask any one of our specialists who will be pleased to custom design your Tahiti vacation experience. Packages are valid for travel from January 15 – May 31, 2017 (must return by June 12, 2017). Call 1-877-GO-TAHITI (1-877-468-2448) or send an email request for information or to book a package. This week-long cruise offers an intimate look at French Polynesia, beginning in Raiatea and visiting Bora Bora, Tahaa and Huahine. *Terms and Conditions: Prices shown are suggested retail price including r/t air from Los Angeles via ATN, domestic flights or ferry in French Polynesia, hotels and transfers in French Polynesia and all carrier imposed charges, government taxes including 9/11 security fee, except $2.50 per person per night local hotel occupancy tax on some Islands which must be paid by the user direct to the hotel. Prices are based on double occupancy, two people travelling together. Packages are valid for travel from January 15th, 2017 to May 31, 2017. Hotel and air space not available on every day. Higher prices may apply based on weekend travel and airline seat and hotel room type availability. Before payment is made, prices are subject to change and are correct as of 1/9/17. After payment is made, cancellation and change fees apply if travel dates are changed or cancelled. Valid Passport is required and for non US and Canadian citizens, a visa may be required. This sale expires on February 28, 2017. Other conditions apply.